Recanes are made by using your old reeds - we strip back the cane and binding to leave just the staple (cork and metal base) and we bind on a new piece of cane (the reed has been "re-caned"). They play like new reeds and last just as long. 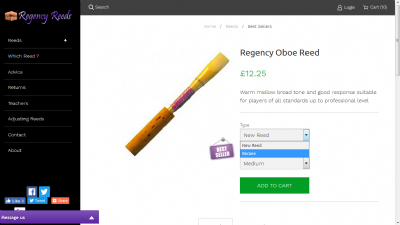 How to order: Recanes are ordered from the same page as new reeds. First navigate to the reed you want, in the "Type" box select "Recane" and in the "Strength" box select the strength you want, then click "Add to Cart". NOTE: when you order Recanes you will need to post the correct number of old reeds to us. Please make sure the corks are not broken or marked in ink.